Long security checkpoint lines can happen at any time, not just during a government shutdown. TSA workers are deemed essential employees and were required to work without paychecks (which were deferred) during this month’s federal government shutdown. While the nation’s air travel system did not shut down, many TSA employees called out sick because due to financial disruption. The resulting staffing shortages presented issues for airports and for air travelers. Shutdown or not, security wait times can increase when you least expect it. During the shutdown, the TSA reported that the security check-in wait lines were increased but often shorter at some larger airports and longer at smaller ones. The exception was Atlanta Hartsfield Airport, considered the busiest in the world, where wait times were up to 88 minutes at one point and then dropped to 25 minutes on a following day. Will There Be Another Shutdown In February? With the temporary reopening of the government, there’s no way to know if there will be another government shutdown in February — or any time in the future. If another shutdown occurs, air travelers should be prepared in advance as airport security checkpoint delays may occur again along with flight interruptions. According to a Consumer Reports, the following six strategies may help keep you calm as you navigate lengthy security lines now and any time you travel, regardless of a government shutdown. One: Enroll in an expedited traveler program. One of the best ways to get through airport security faster is through a program that prescreens travelers and offers dedicated security lines for members. TSA Pre✓® is a federal program operated by a private company, IdentoGO. It typically usually takes two to three weeks to process your application. The cost is $85 for five years. Because IdentoGo is a private company, you can apply for enrollment during a shutdown if you didn’t have a chance to apply beforehand. Those who are enrolled claim that lines move much faster whenever they travel. Learn more at IdentoGo. CLEAR is more expensive at $179 per year but offers a quicker application process. Using biometrics and identifiers such as your irises and fingerprints, CLEAR is considered to be the most accurate form of identity verification. The lines tend to be shorter than the lines at TSA Pre✓® because of dedicated kiosks. How it works: After presenting your boarding pass, your irises are scanned and you are then escorted to the front of the TSA Pre✓® or the regular screening line. Learn more about CLEAR. Global Entry is a U.S. Customs and Border Protection (CBP) program for International travelers. It includes TSA Pre✓®, so when you enroll in Global Entry you are automatically enrolled in both programs. With Global Entry your immigration and customs processing times are shortened when you reenter the U.S. When checking through Global Entry kiosks, you’ll bypass the long immigration screening lines. Global Entry is the most popular choice for frequent international travelers because it includes TSA Pre✓®, costs only $15 more than TSA Pre✓®, and may reduce your total international travel time by hours. Apply for Global Entry. Not sure which is best for your travel style? Compare the three options before you apply at FlyClear.com. Two: Check airline benefits. Have elite status with an airline as a frequent flier, or flying on a business or first-class ticket? Some airlines provide dedicated lanes that are faster. For example, Southwest Airlines provides members of its Rapid Rewards loyalty program expedited security in some cities and for customers flying business class. Three: Pay extra for expedited security check-in. Some airlines give you the option of paying extra to get expedited security entry. It’s typically offered as a perk when you book but you can also ask for it when you check in. JetBlue, for example, offers Even More Speed, where passengers pay for access to an expedited queue. The fee is an additional $15 that you can purchase when booking or checking in. It’s included with an Even More Space seat on JetBlue.United Airlines offers Premier Access for an additionally $15, although it can cost more depending on the destination airport. Four: Download and use helpful travel apps. The MyTSA app https://www.tsa.gov/mobile provides airline passengers with 24/7 access to the most frequently requested airport security information on any mobile device. You may save time with their helpful tips: check delays, current weather conditions, and how busy the airport is likely to be on your specific day and time of travel based on historical data, and more. The MyTSA app is currently up and running during the shutdown. 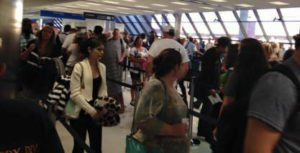 While the TSA information may not be current due to the lack of funding, real-time travelers often share security processing times for most U.S. airports. The app is based on location services from individual travelers who have passed through security. The app is available online only. It’s free and is available for both iOS and Android devices. Five: Check airport information. Some airports, including Atlanta, Denver, Houston, and New York/La Guardia post delay times on their websites, but others do not. Security line wait times may be posted on their website — you may find better information than what is available from the TSA, particularly since the TSA website hasn’t been updated since December 0f 2018 due to during the shutdown. Alternatively, log in to Twitter to check wait status by airport — other travelers may post helpful, up-to-date information as well. Six: Look for an alternate security gate at the airport. You don’t have to go to the security line closest to your gate. Most major airports have several security checks points within a terminal. Ask when you check in if there is another line. If you have enough time, it may be worth the longer walk. Caveat: if you go to another terminal seeking a shorter line, make sure that the terminals are connected to avoid going through security again. Some credit cards also provide benefits for air travelers. Check out Points Guy’s latest article about credit card travel perks. The best way to avoid delays is to plan ahead and get to the airport early. For example, Boston Logan Airport currently recommends arriving two hours prior to domestic departures and three hours prior to international departures to ensure adequate time for check-in, security screening, and travel to your gate. Security checkpoints normally open one hour prior to the first departure of the day. Check your flight and airport status by checking airlines and airport websites or utilizing their mobile apps. iFly is a great resource as well. Boston Chauffeur provides limo service to 550 cities worldwide, including Boston’s Logan International Airport. When you reserve your airport limo service with us, our logistics team factors road and airport traffic, weather, security delays, and more when recommending the best pickup time for your airport departure or arrival. Sources: Multiple sources were utilized for the blog post including the Wall Street Journal, TSA.gov, Consumer Reports, Massport/Logan Airport, and Wikipedia.